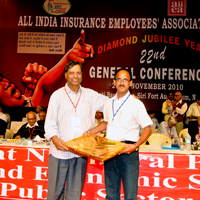 Com.K.Venu Gopal, charismatic General Secretary of All India Insurance Employees' Association , retired on 30.9.2011 after having 40 glorious and purposeful years of service in LIC. The Stalwarts like Com.Chandra Sekhar Bose, Com.N,M.Sundaram, Com.R.Govindarajan, Com.Rajappa, Com.Natarajan, Leadership from all Zones and Leaders from Fraternal Trade Unions attended the felicitation Function of Com.K.Venu Gopal. The applause was remarkable. Com.K.Venu Gopal rightly said it was felicitation to AIIEA, but not to him individually as he was product of AIIEA. The Speeches delivered in the felicitation underlined significance for further Strengthening of AIIEA on all Fronts. The felicitation inspired the attending comrades to rededicate themselves for Safeguarding LIC and GIC in Public Sector. Nice to watch these events as memories !